The Hawks were tied at halftime with the best team in the country last Friday: the Carleton Ravens. Laurier was down early in the first half by as many as 11 points. However, they were able to battle back and tie the game right before halftime, thanks to an offensive explosion from guard Tevaun Kokko. It has become a recurring pattern for the Hawks to fall behind early in games and get back into it as the game starts to wind down. Their resilience, however, was not enough on this day. The Carleton Ravens showed their quality in the second half and started the third quarter on an 18-0 run, eventually winning by a score of 109-73. Hawks head coach Justin Serresse talked about the team’s second- half struggles after the game. 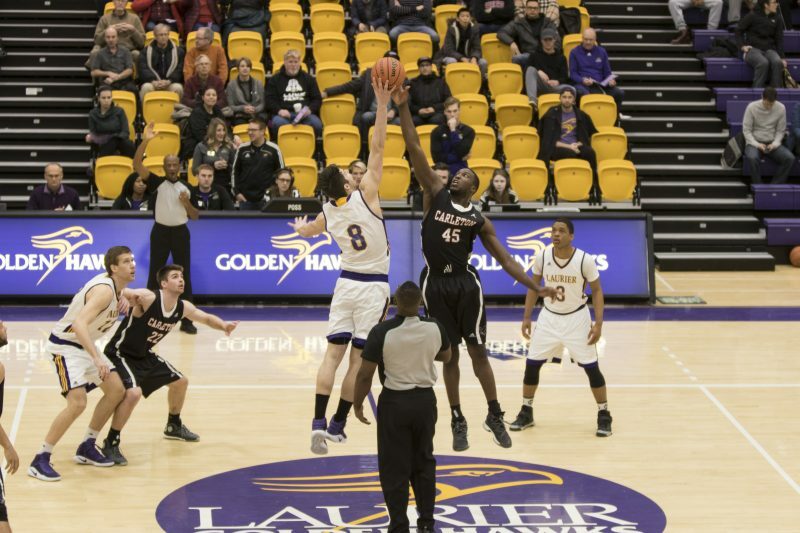 Rebounding was an issue throughout the game for Laurier, as the Hawks were outrebounded 54-23. This ultimately lead to the Ravens scoring 25 second chance points, compared to just 6 for the Hawks. This game was the first game back from the winter break and rust could be seen on both teams. However, Serresse did not use that as an excuse for the poor rebounding effort. “Some of our big men were a little banged up,” he said. Despite the tough loss, Kokko put on a show, especially in the first half. He finished with 27 points, while shooting an absurd nine out of eleven from the field and five out of six from three-point range. Kokko’s performance should not surprise anyone, as he has been the Hawks best offensive weapon all season. The Markham native is averaging a team high 17.8 points per game this season. When asked if the Hawks rely too much on Kokko, Serresse pointed out that he is their best player and it is only natural for the best player to carry the load offensively. “I thought he played an amazing game. I didn’t play him too much in the second half because we got a lot of games coming up. I wanted to make sure he would be fresh for tomorrow’s game and next week’s game,” said Serresse. The Ravens also relied on their best player, as starting guard Kaza Kajami-Keane matched Kokko’s performance by scoring 24 points, while shooting an efficient ten out of thirteen from the field. With this recent loss, the Hawks are now half a game back of the lead in the OUA West standings.